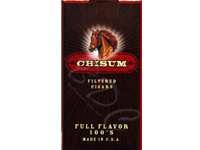 Everybody knows that cigars and cigarettes are completely different animals. They taste different, they're made of different kinds of ingredients, and require a completely different process to manufacture. Generally speaking, a good cigar is expensive and takes a pretty long time to enjoy. 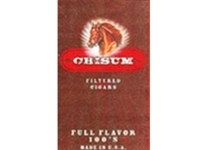 Years ago at Farmer's we began asking "is there a way to deliver all the flavor cigar smokers expect but at a fraction of the cost, with about the same burn-time of a cigarette?" 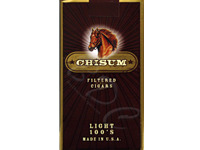 After working his magic, Happy Wiglesworth finally hit on the perfect blend, and we introduced Chisum Filtered Cigars. 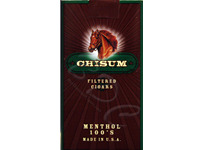 It's made of a blend of mostly Dark Tobaccos with a wrapper that's all tobacco to boost the aroma and taste. Cigar smokers are telling us we've hit one out of the park, and cigarette smokers are thanking us for an easy, inexpensive way to enjoy the cigar experience when they feel like it.